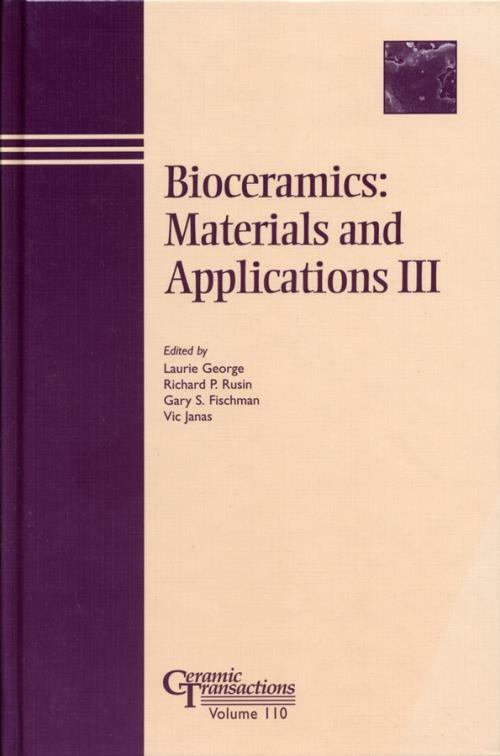 This third installment draws together research in the different aspects of bioceramics and focuses on the biomedical application of ceramics from a materials science viewpoint. This collection of papers addresses ceramics and glasses used in biomedical, dental and biological applications. In Vitro Stability Predictions for the Bone/Bioglass and Bone/HA Interactions (M.J. Crimp, D.A. Oppermann and U.U. Doctor). Glass Hydroxyapatite Coatings on Titanium–Based Implants (J.M. Gomez–Vega, E. Saiz, A.P. Tomsia, G.W. Marshall and S.J. Marshall). Synthesis of Hydroxyapatite via Mechanical Activation (K.C.B. Yeong, J. Wang and S.C. Ng). Preparation of Biomimetic HA Precursors at 37°C in Urea– and Enzyme Urease–Containing Synthetic Body Fluids (D. Bayraktar and A.Cüneyt Tas). Physical Characteristics of Sintered Hydroxyapatite (T.P. Hoepfner and E.D. Case). Spray Dried Titania Cell Carriers (K.–L. Eckert, E. Wintermantel and R. Gadow). Crystallization of SiC on Bilogical Carbon Precursors (H. Sieber, H. Friedrich, A. Kaindl and P. Greil). Surface Properties of Layered Double Hydroxide Nanocomposites (O.C. Wilson Jr., T. Oloruyolemi, A. Jaworski, L. Borum, D. Young, E. Dickens and C. Oriakhi). Near–Net–Shape Forming Technique for Bioceramic Components (A. Salomoni, I. Stamenkovic, L. Esposito and A. Tucci).In Vitro Bioresorbable Fiber Dissolution (S.H. Lee and A.G. Clare). Scope of Piezoelectric Devices in Determining Inner Ear Function (N. Mukherjee, R.D. Roseman and J.P. Willging). 2 Composite Coatings (L. Fu, K.A. Khor, V.J.P. Lim). Oxide Ceramics with Calcium Phosphate Coatings (J. Cihlar, M. Jez, K. Castkova and M. Trunec). Processing, Biocompatibility and Biomechanical Testing of Porous Alumina Ceramics (S. Bose, J. Darsell, L. Yang, D.K. Sarkar and A. Bandyopadhyay). Development of Bioceramic Tissue Scaffold via Fused Deposition of Ceramics (I.A. Cornejo, T.F. McNulty, S. Lee, E. Bianchi, S.C. Danforth, A. Safari, K.S. TenHuisen and V.F. Janas).